If you're looking for the tastiest, creamiest and most delicious ice cream NY can offer, look no further than this list of the best ice cream parlors in New York. Soft serve or scooped, in cones or bowls, with sprinkles or fudge, you'll find these parlors have the best there is. Blue Marble has been delighting New York residents since 2007 with delicious ice cream flavors made of fresh ingredients that are sourced directly from local farms. This brand takes pride in providing ice cream flavors with a natural taste thanks to organic ingredients that are devoid of preservatives and artificial additives. All ice cream entrees are prepared with naturally pasteurized milk from Blue Marble’s dairy plant. Upon visiting the store, you can accompany your mouth-watering scoop of ice cream with cakes and sandwiches. If you are planning for a special occasion, make it extra special by serving your guests with the healthiest ice cream in NYC. Blue marble can help with that as it offers catering services for private events. The Most Delectable Ice Cream Flavors in New York! Ever since being established in 1978, Chinatown Ice Cream Factory, a family run business, has continued to be one of the best ice cream shops in New York. Locals and visitors alike stop by here to try out delectable Chinese and American ice cream fusion after exploring the amazing sites of Chinatown. Regulars can indulge in exotic Chinese flavors such as pistachio, oreo, and pumpkin pie or perhaps the common vanilla, chocolate and strawberry flavors. Other mouthwatering entrees include lime, mango, lemon and blueberry sorbet flavors. Opening hours are from 11:00 am – 11:00pm every day of the week. The establishment boasts over 28 years of making delicious deserts and the best ice cream flavors in New York. 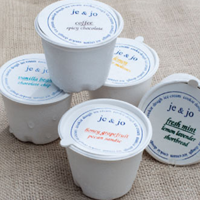 Proudly serving ice cream from biodegradable cups made of sugar cane fiber, Je & Jo offers custom-made ice cream with a focus on facilitating sustainability throughout their products. This joint has made it on the growing list of New York ice cream shops that care for the environment. Each cup of ice cream comes with signature cookie dough prepared with 100% all natural ingredients. Alternatively, you can enjoy the delicious cookies with a cup of freshly brewed coffee when visiting the shop. The wide variety of ice cream flavors includes options such as vanilla bean, fresh mint, guittard chocolate, nutella and cardamom. Backed cookie dough options range from lemon lavender and roasted banana to peanut butter, spicy chocolate and hazelnut flavor combinations. Check out Je & Jo’s main site for updates on new ice cream flavors and menu entrees. Located in the Prospects Height neighborhood of Brooklyn, Ample Hills Creamery is regarded to be one of the finest ice cream shops in NY. In addition to excellent all-natural ice cream flavors, this snack store offers delicious cakes topped with chocolate fudge, caramel or whipped cream. You can also spoil yourself with some ice cream covered cakes that provide a different way to enjoy your favorite flavors. Choose from one of the 24 natural flavors that change every day of the week. The menu also includes floats, milkshakes pies among other pastries. The store opens its doors from 9:30 am until 7 pm Monday to Friday, 10 am to 7 pm on Saturday and 12 noon to 6 pm on Sunday. Known as one of the finest ice cream shops in NY, il Laboratorio Del Gelato is a great place to stop by for some delicious sorbet, frozen dessert and ice cream cones. This Italian style ice cream shop takes pride in offering a wide array of unique and custom-made flavors. On a daily basis, you can choose from 48 different flavors on the menu. Gelato flavors keep changing throughout the week, which makes this joint a great place to take an ice cream tasting tour. In addition, iL laboratorio del gelato offers free delivery for six days a week to clients with bulk orders. Operating hours run from 7:30 am to 10 pm Monday through Thursday, 10 am to midnight on Saturday and 10 am to 10 pm on Sundays. Some of the Best Homemade Ice Cream in NYC! Sundaes and Cones is touted for being one of the best ice cream parlors in New York, a title that this joint has earned for its delicious homemade entrees. Choose one of the delicious flavors that range from vintage chocolate and strawberry to unique tangs of black sesame, ginger, corn and Asian wasabi. On offer, there is also low sugar and no-fat ice cream for those that are health conscious. In addition, Sundaes and Cones guests can indulge in frozen yogurt, ice cream coated cake, homemade hot fudge and delectable whipped cream. After a hot afternoon of city exploration, this NY-based ice cream parlor is a great place to stop by for a refreshing bite. Business hours start from 11:00 am to 11:00 pm Mondays to Thursdays and 11:00 pm to midnight on Saturdays. Serving the Best NY Ice Cream Toppings Since 2009! Big Gay Ice Cream shop started out as an ice cream truck back in 2009. This business establishment received rave reviews from NBC, New York Magazine, The Daily News, The New York Post, Daily Candy and CBC radio among other renowned sources. Today, this New York based ice cream shop is one of the must-visited joints for some delightful ice cream and unrivaled toppings. Among the mouth-watering ice cream toppings includes such varieties as nila, tamari, wasabi, wafers, pea dust, sea salt, olive oil and more. This New York Ice cream joint is open on Monday through Wednesday for afternoon and late night snacking as from 1:00pm to 12:00 am and Tuesdays from 4:00pm to 11:00 pm. The menu also includes shakes, sundaes and floats. Since its launch in 2008, Van Leeuwen Artisan Ice Cream store has gained a great reputation for offering tasty ice cream churned from fresh and locally sourced ingredients. The store owners offer creamy rich ice cream infused with nature-inspired flavors such as hazelnut, mint, chip, ginger, gianduja, espresso, pistachio and palm sugar. In addition, this NY ice cream store provides complementary home baked pasteries and freshly brewed Toby’s Estate coffee. The business has received special recognition in recent years from prestigious media sources such as The New York Times, Inc Magazine, The Wall Street Journal and NBC. Van Leeuwen Artisan Ice Cream also operates other stores in three different locations based in Manhattan and Brooklyn. Try Some of the Best Italian Gelato in NY Made with Top Ingredients! Best known for its Italian style gelato, L’arte del Gelato is one of the most talked about ice cream shops in NY. This snacking joint has been raved about both in print and digital media on the Daily News, New Your Times, The L Magazine, iVoice among other sources. The store boasts of fresh gelato made of top ingredients like hazelnuts, cinnamon, vanilla, licorice, cocoa and more. All the scrumptious entrees are prepared the same day to ensure that clients get a blend of fresh and naturally prepared gelato. If you are seeking for the perfect place to enjoy a delicious bite, you can relax and unwind in the cozy ambiance at L’arte Del Gelato as you choose from one of the award-winning sorbet and ice cream flavors. Take out gelato is also available for those that want to enjoy tasty ice cream at home. Offering its esteemed customers over half a dozen gelato and sorbet flavors, Stellina should top your list of places to visit when looking for the best Italian ice cream in New York. Some of the flavors available such as la strada, fior di latte and chunky sorella come with fancy names, but also taste just as good. The menu entails additional treats like candy, milkshakes, sandwiches, cakes, salads, coffee and tea. 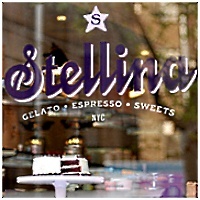 Apart from the delightful ice cream and tasty fare, Stellina invites its guests to a casual, brightly lit atmosphere. Daylight cascades through the floor to ceiling glass door and windows at the entrance and reflects off the cream white walls, allowing visitors to enjoy their meals in a vibrant ambiance. This NYC ice cream cafe is open from 3pm to 10pm daily except Sundays.